Lovely people; rich in culture and wildlife; a magnificent and challenging history; delicious food; great value; and safe. 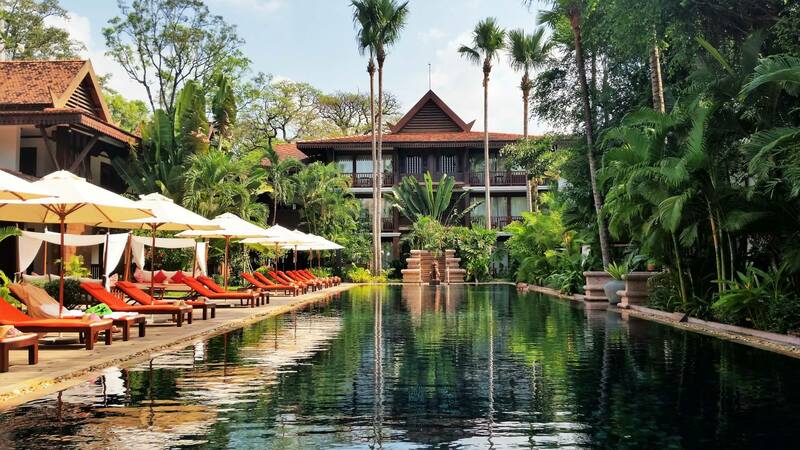 So many reasons to love Cambodia — it’s a true gem in SE Asia. From my first visit in December 1998, to my third, and most recent, in March 2017, Cambodia remains one of my favorite destinations. For centuries the powerful Khmer Kingdom, precursor to modern Cambodia, ruled over much of SE Asia. Recent history has been less kind–warring with neighbors, a brutal civil war with the Khmer Rouge, the U.S./Vietnam War, and painful concessions to Vietnam to help oust the Khmer Rouge and end the civil war. But that was many years ago. Today, Cambodians embrace peace and look to the future. 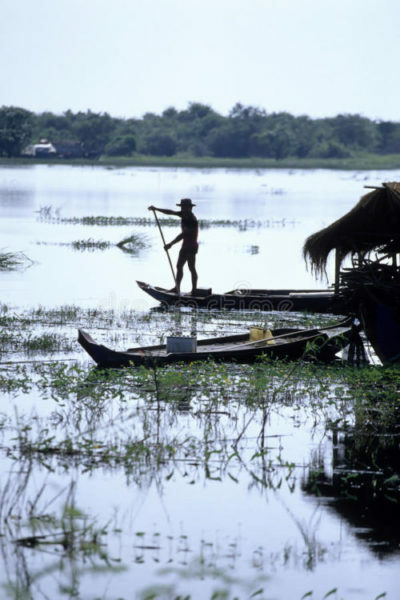 Cambodians live in one of the most bio-diverse areas of the world including the great fertile Mekong Delta and River, and the Tonle Sap Lake and River, which meets the Mekong River in the capital Phnom Penh. Many claim the beaches and islands are like Thailand’s 20 years ago. Susan Bruce Travel helps you travel in ways that support sustainable tourism! And tips for where to go, what to do (and not do!) and where to stay. While tourism is increasing rapidly, Cambodia is still off the major tourism radar — so now is a great time to visit. International air gateways are the capital Phnom Penh; Siem Reap, the gateway to the great Angkor temples; and Sihanoukville on the coast. The provincial capitals are fascinating; countryside and beaches beautiful; and lots of opportunities for off-the-beaten track exploring. 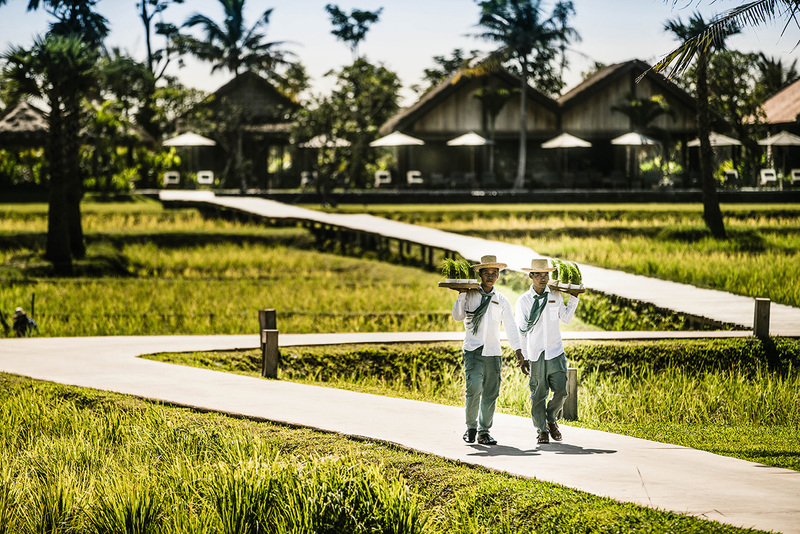 You’ll find excellent luxury properties, some in the middle of rice paddies or on private islands; and cool eco-lodges. You can get a taste of life along the Mekong River via a short boat ride from Phnom Penh, or longer explorations along the river. And as an up-and-coming-destination, Cambodia offers great value! The Angkor temple complex, a UNESCO World Heritage Site, is the reason most people travel to Cambodia. And it merits its place on bucket lists! Angkor was built by a series of kings during the magnificent 9th-15th century Khmer Empire. The most famous temple Angkor Wat was originally built as a Hindu temple but over time transformed into a Buddhist one, as that religion took on more importance. It is the largest religious monument ever built. 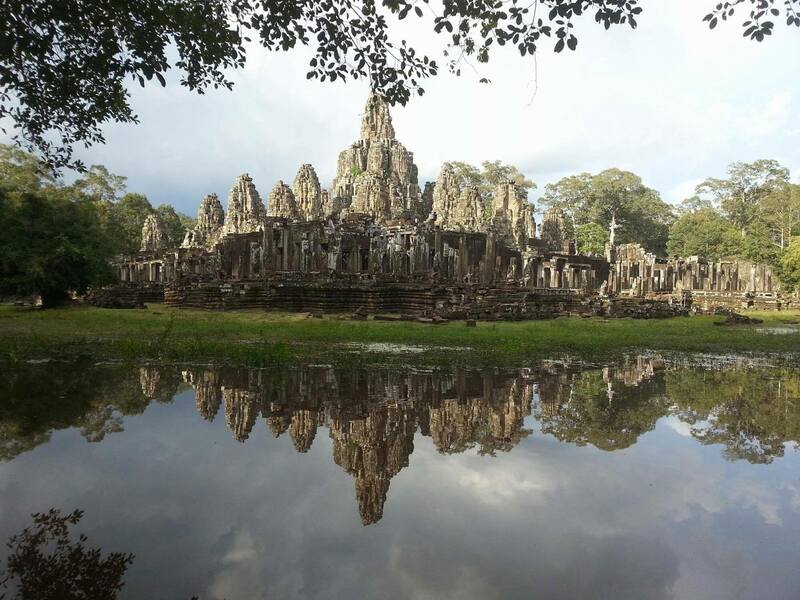 Other famous temples include Angkor Thom, slowly being reclaimed by the jungle; and the Bayon Temple with stunning carved bas-relief faces. Each of the many temples has its own style, history and ambiance. When I visited this gateway city to Angkor in 1998, there were only a handful of good guest houses and the Raffles Hotel. 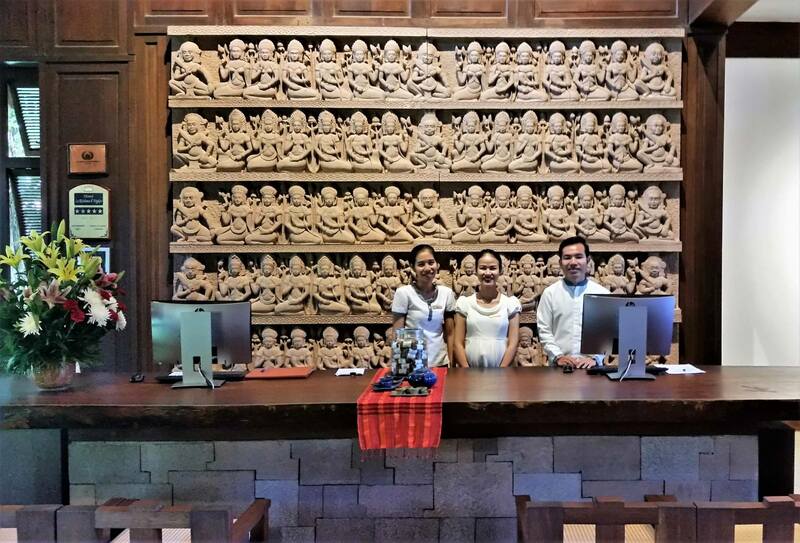 Now Siem Reap is a bustling town with a wide range of wonderful places to stay. I can’t believe how much the town has grown, but still retains its charm, artistic entrepreneurship, soothing spas and easy access to temples and countryside. For those interested, Siem Reap boasts an acitve night life. One of my favorite night explorations is to do a food tour by tuk-tuk. 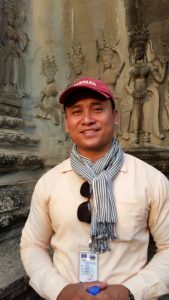 You can spend one night and see Angkor Wat or spend a few days and ride bikes, hike in the countryside, dine, or just hang out, with a local family, experience Angkor temples at night, visit an artist workshop, spend time with monks, and do any number of activities hands-on from planting rice to making traditional pottery. Siem Reap is also home to Phare — a wonderful circus/performance art by talented disadvantaged youth. Tip: When in Siem Reap, don’t miss visiting nearby Tonle Sap, the largest freshwater lake in SE Asia to witness floating villages, houses high up on stilts to evade the reach of seasonal waters, huge fish traps, and an economy and way of life deeply intertwined with the lake and its rising and falling waters. Less than an hour away from Siem Reap, the lake is ever changing, fascinating, and thrumming with life! 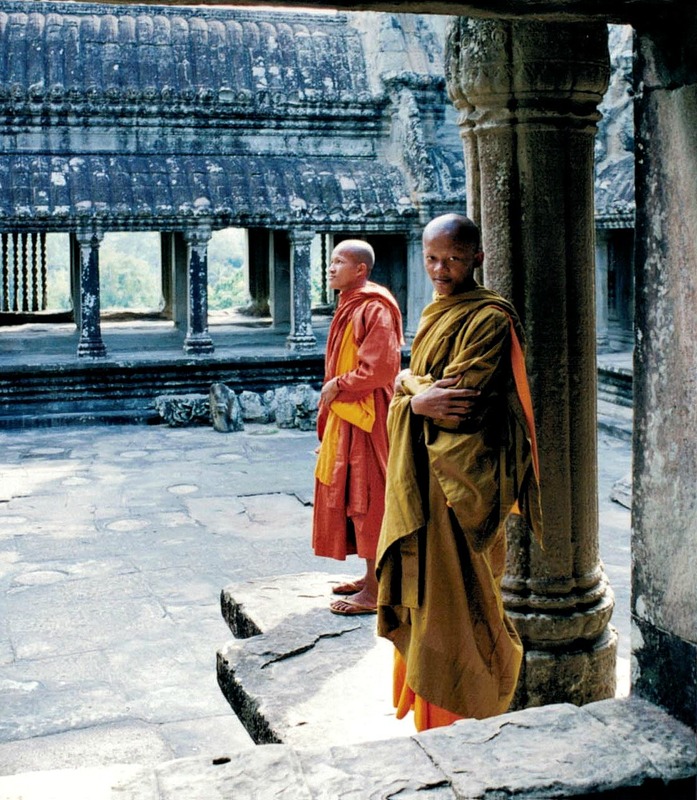 Most Cambodians are Khmer ethnicity, speak Khmer and are followers of the Khmer style of Buddhism — a blend of Theravada Buddhism, Hinduism, animism and reverence of the dead. 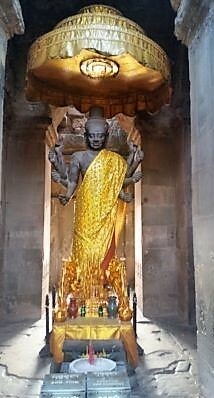 Cambodia is a wonderful country in which to learn about Buddhism and other religions — it is all around you if you look. One morning, after a dawn walk around Angkor Wat, I had breakfast in a private garden. 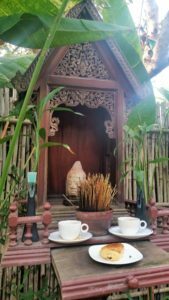 I discovered a small offering temple in one discreet part of the garden displaying a fresh croissant and 2 coffees – breakfast for the ancestors. There’s even an Ancestors Day national holiday in the fall to pay respects to the deceased. This connection with departed loved ones touches me. A rewarding and interesting way to start your day is giving alms to the monks – their main form of income, which can include food, money or even something useful like a box of toothpaste. They give back multi-fold to the community. 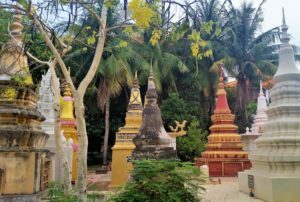 Phonm Penh is a great place to learn about Khmer and Cambodian history, arts, and modern life. Illustrations of Cambodia’s fascinating past abound. 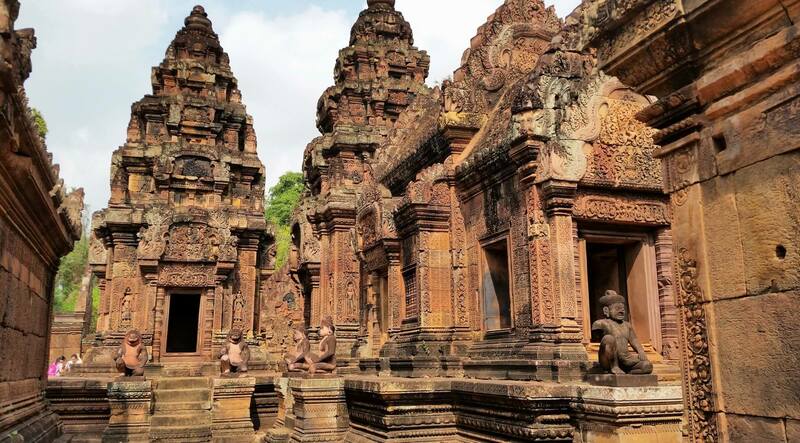 The Angkor complex and its carvings showcase Cambodia’s Khmer grandeur in its hey-day. The Khmer Kingdom ruled from 802 AD to its collapse in the15th century. From 1863 to 1953 Cambodia was under French rule. Architecture and style from the colonial period are visible throughout the country–from the capitol to Siem Reap to Kep-sur-Mer on the coast. French is the country’s second language, but that is changing with the younger generation for whom it’s English and Chinese. In the 1960s and 70s, the U.S. Vietnam war expanded into Cambodia. Although Cambodia has rebuilt, this era took its toll on the country. In 1975, or “Year Zero,” the communist Khmer Rouge took over, aiming to implement a communist program of agrarian reform and equality. Up to 1/4 of the population died in “the killing fields” and it was a huge failure. When I was in Siem Reap in 1998 I saw trucks with soldiers still returning from the jungle to their homes after the collapse of the Khmer Rouge. There are many museums and experiences where you can understand this tragic period. Although in some ways excruciating, understanding Cambodia’s history and relationship with its neighbors and the world enhances your experience in this country. Cambodia has always had a complicated relationship with Vietnam but each country is healing from war and focused on the future. Modern Cambodia is an amalgam of this past and a thriving desire to move forward. Many great projects and people are protecting the past and the future. One of the best places to experience the old and new Cambodia is in it capital Phnom Penh, which hosts a plethora of modern hotels, museums, government and religious temple complexes, including the gilded Royal Palace. © Susan Bruce 2017 My awesome guide, Borin. You’ll find the people in Cambodia to be kind, gracious, open, and hard-working. It is a lovely culture known for its hospitality, music, art and culture. Living standards have improved in the past 15 years but people are still poor and need the powerful economic generator and cultural exchange of tourism. It’s worth getting to know your local hosts up close. There’s no shaking hands or waving in Cambodia. The official way of greeting is a sampeah — placing both palms together like a lotus flower in front of the chest. Cambodians may smile even if they don’t understand what you mean, know an answer, or agree, as losing face and showing anger is embarrassing and to be avoided. Be patient; often explaining again slowly and gently does the trick. Due to the heat in the middle of the day, life starts early in Cambodia. Plan your outdoor activities in the morning. Relax in the afternoon or be in the shade. This also means early bedtime, with many local restaurants closing their kitchen at about 9pm–unless you are in the capital, which can go all hours. Tip: The Landmine Museum in Siem Reap is mostly indoors and worth a visit. Learning a bit of Khmer, particularly courtesy words, goes a long way in Cambodia. Your hosts will be so pleased when you say aukun – thank you. Those who know French may find it useful, particularly among the elderly. Not as spicy as its neighbors’, Khmer food is based on rice and eaten throughout the day as deep-fried rice cakes with chives and spinach for breakfast, kuyteav, the country’s famous rice noodle soup, or plain, with grilled freshwater fish, a samlor or soup, and an assortment of seasonal salads and vegetables. Try some of the many fresh juices of familiar, and new, fruits. 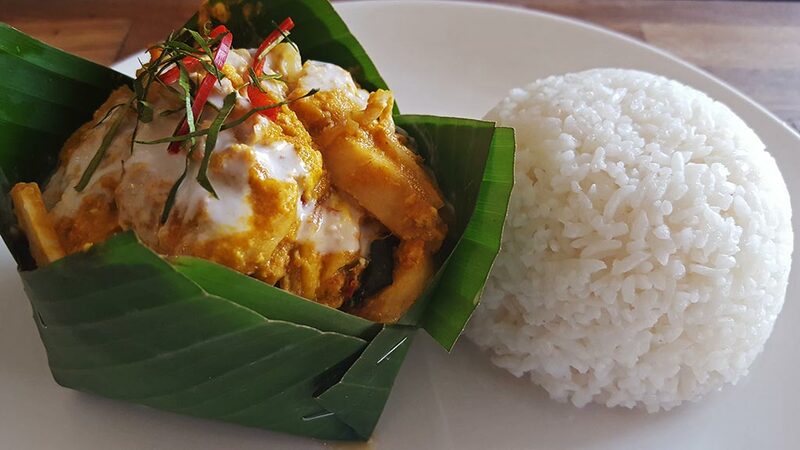 Perhaps the best-known Khmer dish is amok— white fish steamed in a banana leaf and topped with coconut cream. Beef and pork are commonly served with rice or noodles, typically with fresh herbs and some kind of curry. Much of the population depends on fish and marine life in the coastal areas, seas, rivers and lakes. 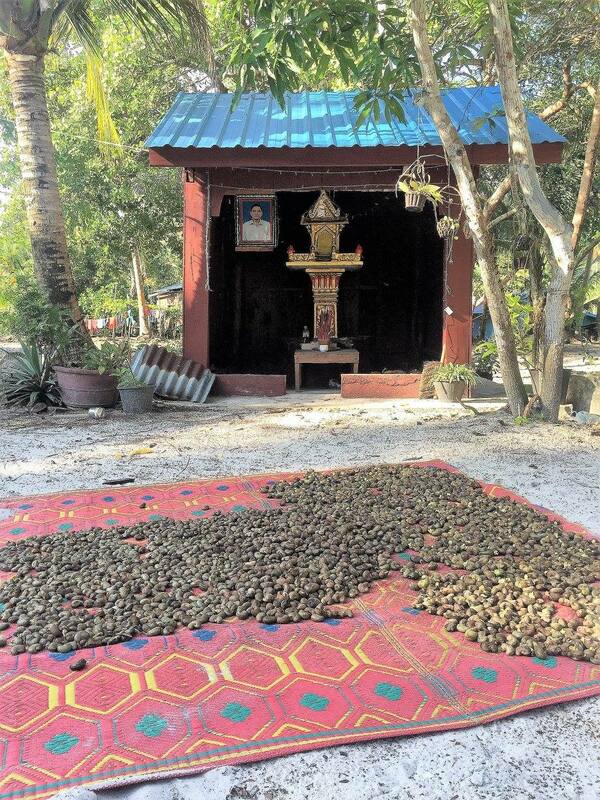 Cambodia is also home to the famous Kampot Pepper, which comes from the south and flavors dishes like stir-fried pepper crab. 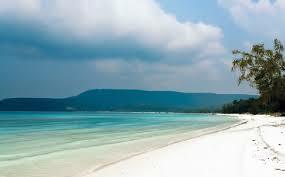 When to Go: The most popular time to visit Cambodia is November to April, the dry season when temperatures are lowest. However, the green season from May to October eliminates the crowds and brings delights of its own such as full moats around Angkor temples, dramatic skies, verdant rice-paddies and experiencing Tonle Sap Lake when waters are high. Location: Cambodia borders Vietnam, Laos and Thailand, so although it merits a visit independently, it’s easy to combine a trip with a neighboring country. 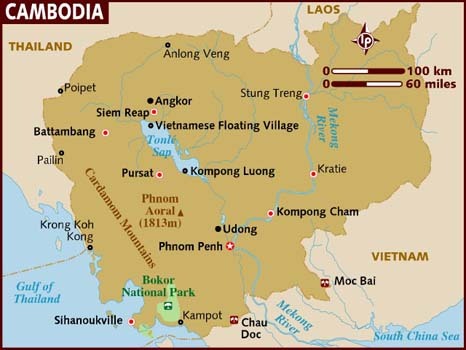 But gloriously, Cambodia is quite unlike it neighbors with treasures and a culture of its own. Great Value: Like much of SE Asia, Cambodia offers excellent prices and value. Rooms and villas tend to be relatively spacious. Maybe enjoy some of your savings for a special splurge at Song Saa Private Island? Markets: Be sure to visit the lively markets, day and night, that dot Cambodia and offer everything from fresh produce to exquisite crafts. The most famous ones can be found in Phnom Penh, Siem Reap and Sihanoukville. 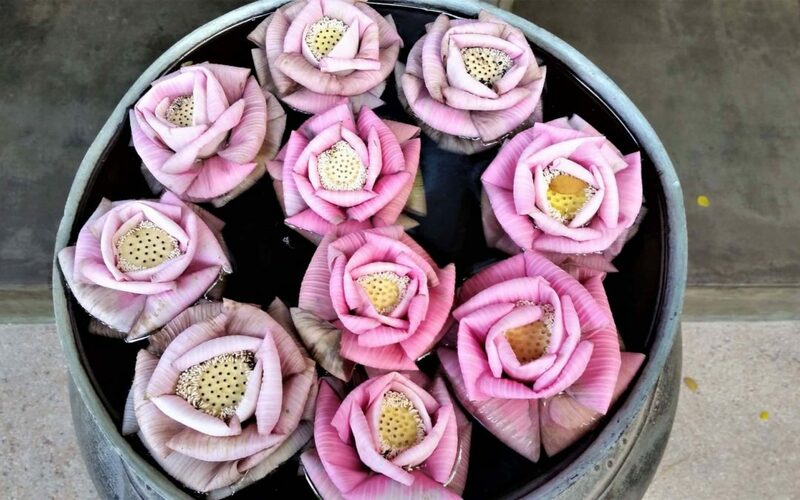 Crafts/Souvenirs: Cambodia has a long tradition of producing high-quality silks; stone and wood carvings; silver jewelry; candles, balms and other goodies made from essential oils (lemongrass is a favorite). A pouch of Kampot pepper, or the ubiquitous and essential Cambodia checkered scarf, the karma, also make good souvenirs. 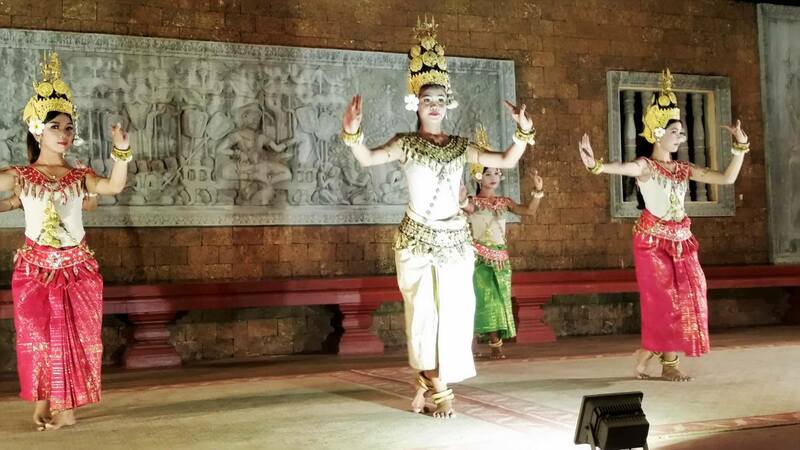 The past few decades have seen great efforts to revive the arts, devastated during the Khmer Rouge era. The reputable Artisans of Angkor boutiques sell products made by retrained craftspeople. Experience this exotic, lovely, and safe country yourself!